In April a dinky little sample bottle of wine arrived on my desk from venerable UK Wine Merchant Berry Bros & Rudd. The wine in question was a tawny Port bottled by the famous shipper Graham, and coming from the 1952 vintage. Now, a 60-year-old wine being released onto the market is not an everyday occurrence, but then this wine was bottled for a very specific purpose: to celebrate the Diamond Jubilee of Queen Elizabeth II. As holders of two Royal Warrants, Berry Bros is the rather fitting purveyor of the very limited supply of this wine that is available. I am lucky enough to taste many great wines, but as I tasted this extraordinary wine it struck me powerfully how context can be such a crucial factor in turning the enjoyment of a great bottle of wine into a truly profound and memorable experience. In the past I have named the 1989 Château Haut-Brion as my ‘Best Wine Ever’. Although an absolutely exquisite wine, there’s no doubt it was the context in which it was drunk that etched this particular bottle on my memory: sitting one balmy July evening on the ocean-side terrace of a restaurant in southern France as the sun set on the horizon, the marriage of a brilliant wine, dream location and great company added another dimension. And so to the 1952 tawny from Graham’s, a wine that has sat in oak casks in Graham’s Oporto lodge for 60 years. A wine from 1952 is of course a perfect way to pay tribute to the UK’s long-governing monarch, but what other stories could this wine tell about that year? 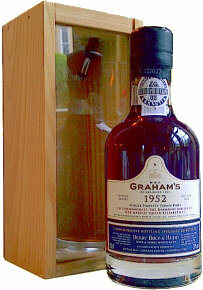 A limited number of bottles of the Graham’s 1952 Tawny went on sale on 1st May 2012. The wine is priced at £275 per individually numbered bottle or £795 for three bottles presented in a hand-crafted wooden box. Some Jeroboam (4.5 litres) at £1,800 are also available, all from Berry Bros. & Rudd. This 20% ABV Port has been in cask until its recent bottling. The colour is mahogany brown at the core, with tawny on the broad rim. It is visibly thick and quite viscous in the glass. On the nose, aromas of deep, dark fruit cake and walnut are joined by an inherent red fruit ripeness at the core, but lovely glimpses of old polished wood, roasting chestnuts and toffee add layers of interest. On the palate it is glycerine rich, and still abundantly sweet. Those dark, mature, roasted and caramel flavours dominate, but there’s a figgy pudding richness to this still, and terrific acidity as Seville orange and lemon zest slice through, and the wine still displays real structure. On the finish it is the sweetness that dominates, the smoothness and intensity all beguiling and impressive as it goes on and on in the mouth. A fabulous old wine, but one that is wearing extraordinarily well. 95/100. £275, Berry Bros & Rudd. Quite some wine, and quite some context.